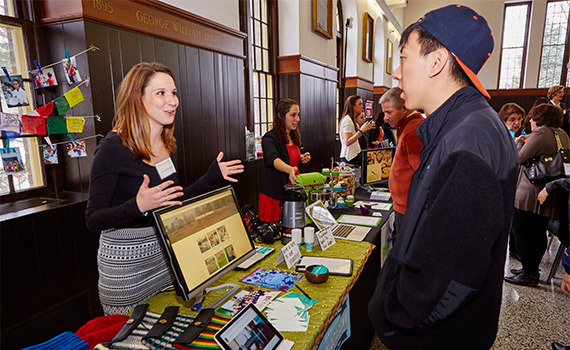 Amanda Brown ’15 (left) talks with a student at Entrepreneur Weekend in April. Brown is one of six eFund winners working in the Thought Into Action incubator space in Hamilton, N.Y., this summer. Being selected for the Colgate Entrepreneurs Fund (eFund) can change everything for a fledgling start-up, especially when combined with incubator space and direct access to Thought Into Action alumni-mentor support for an entire summer in Hamilton, N.Y. The $15,000 award that comes with selection opens doors for these new ventures. Some use the funding to hire product engineers, web developers, advertising buys, or just use the capital to allow for full-time work on an idea that otherwise would be attended to only after working another job. The eFund, originally seeded by parent Dan Rosensweig, is now funded by numerous Colgate parents and alumni. Now in its third year, the eFund has awarded a total of $255,000 to 17 ventures since 2012. The mentoring and expertise that the entrepreneurs in the incubator space receive is just as valuable as the funding, they’ve said. This summer, that mentorship includes advice from alumni including Jason Griswold ’97, Janice Ryan ’94, Amy Jurkowitz ’85, Joey Petracca ’13, TIA Co-Founders Andy Greenfield ’74, Bob Gold ’80, and Wills Hapworth ’07, and many more. “For most of the eFund entrepreneurs, this is the first time they’ve had the opportunity to spend 100% of their time, focus, and creativity on their ventures. They get to stop moonlighting on their idea, and make a hard push at creating success, with capital and mentorship to accelerate their growth … and we’ve seen it work for many of the teams,” said Hapworth. Echo is a mobile app that uses geolocational data on your phone to highlight social events nearby. Only interested in free events? Echo can let you filter out any events that cost money. The duo, friends from high school, have submitted their first version to the Apple app store for approval, and they are now working on their first product update. “Being here makes everything easier,” Buys said. One Fair Harbor swimsuit is made from 11 recycled bottles. Combined with donating 5 percent of their profits to clean-water charities, this ecologically minded active lifestyle brand was created by a brother and sister team now selling their products online and in surf boutiques. “We used our winnings from Entrepreneur Weekend to put our deposit down on our first order, and we’re using our eFund award to pay for the remainder of the order, ” said Jake Danehy. Drakos said studies have shown it’s possible to boost concentration through gentle electrical brain stimulation. This venture aims to make that concept available to the general public through the creation of a new headset designed to increase mental focus. Drakos and Myers are now working on building a Kickstarter campaign, and they’ve hired an engineer to build a prototype of the product. Started by two former Colgate football players in 2013, Platform Athletics is a web-based training platform designed for high school coaches in the development of student athletes. The system includes online leaderboards, individualized workouts, and a coaching dashboard equipped with powerful tracking tools. Breslin and Relph are using this summer to finalize and launch their 2.0 while retooling their marketing message. “The TIA mentors have been invaluable in helping us look at our message and brand in a new light and develop a message that resonates with high school coaches,” Relph said.